You really have to be under a rock if you haven’t heard of this movie. The marketing pockets must run deep because the push has been heavy and inescapable. 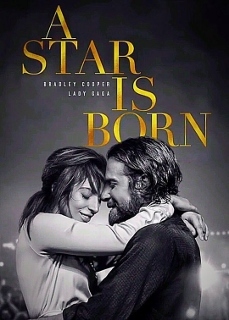 A Star is Born is the new musical-romcom-drama starring Lady Gaga and Bradley Cooper (who also directed the movie). They play Ally and Jackson. When they meet Jackson is a seasoned country musician playing sold out concerts while Ally is a girl with a big voice working a regular kitchen job and living with her dad (Andrew Dice Clay). Jackson turns out to be an alcoholic and pill addict and stumbles into Ally when he walks into a random drag bar for a drink and she just so happened to be performing that night. He is taken by her voice. They spend the evening together and by the next day he is taken by her. During the course of their evening, Jackson finds out about Ally’s voice and songwriting and when he gets her to attend one of his concerts, he forces her on stage to sing with him. They become partners in music and marriage – which involves dealing with his drinking and blackouts -and it opens doors that leads to the beginning of Ally’s solo career. It is pretty cool to see Lady Gaga completely body her character after seeing her get the part in her documentary. It was part of her experience in reality, so she had a well to dig from. But the complete star of the show both on and off screen was Bradley Cooper. Cooper has always been one of the pretty boys that can actually act and he showed this again with this movie. He got a dialect coach to perfect his accent and get his voice to a lower register and he also sang all his songs himself. Live. They both did. Knowing that Jackson is an addict, the angles will depend on how you look at it. You could see Ally as a character who just really loved her man and would do anything for him or you could get angry at how much of herself she had to give to the relationship due to his addiction, that was sometimes to her detriment. If you are looking for Dave Chappelle, he is in the movie for like 5 minutes just as an FYI. I have to say the movie felt a little long and I think some editing could have been used towards the end (it has a 2hr 17min running time). At a certain point, I started seeing Matthew McConaughey in the role haha. Also, one minor thing there were certain scenes that seemed to have been shot after Gaga got her eyebrows done because they were very arched compared to the scenes prior. The final song by Lady Gaga, is it just me or couldn’t you just see Whitney Houston doing it? Overall, I highly recommend this movie. I completely enjoyed every minute of it including the music (save for when Ally goes commercial – yikes). Besides the leads, the many supporting acts also did a good job and Cooper as a director did a very good job of showing the intimacy of Ally and Jackson when they were alone and you can feel how they felt like they were the only two people in the world. I have a feeling we will be hearing his name come award season. Been on a lookout for your opinion on this. I’ll definitely see it before the Oscars.